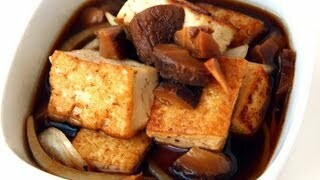 I’m introducing another delicious tofu recipe to you today. It’s very juicy and delicious. I didn’t use any chili peppers or powder, so it will be a good side dish for children or those who can’t tolerate spicy food. Yes, I’m a spicy food lover! But I sometimes feel like eating something mild. The sweet salty tangy brine in this recipe makes the intrinsically tasteless tofu very delicious. You can eat it right after making it, and it’ll last for 2 or 3 weeks in the fridge. This side dish is very versatile. For a quick meal, cook some noodles, put them in a bowl, and add some dubu-jangajji over top with the delicious brine, onion, and chopped mushrooms. Or simply mix some pickle juice with your rice. If you have roasted kim in your cupboard, crush a sheet or two and add it to the rice. Yum! If you have any more ideas on how to prepare this, let me know in the comments below and share your idea with my readers. Remove the tofu from the package. Drain and rinse. Cube the tofu into bite sized pieces. Heat up a pan and add a little cooking oil. Lightly dry off each tofu piece with a paper towel and pan fry until each side is golden brown. Prepare the brine by putting the soy sauce, vinegar, garlic, apple, dried shiitake mushrooms, and water into a thick bottomed pot. Bring to a boil over medium high heat for 10 minutes, then turn down the heat and boil for another 30 minutes. Strain with a strainer. Put the fried tofu and the sliced onion into a container. Pour the strained brine over top, and add the cooked shiitake mushrooms. 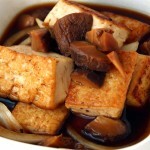 To serve, put some of the tofu, brine, and onions into a serving bowl, along with some of the shittake mushroom, chopped. Serve as a side dish with rice or noodles. To eat, mix in some of the brine with your rice. Eat your rice and take a piece of tofu, mushroom or slice of onion from time to time, too. Posted on Thursday, November 29th, 2012 at 1:34 pm. Last updated on August 7, 2017. Posted February 17th, 2013 at 12:19 am | Log in to reply. So, last night was my first time making this. I’m in love with this already!!! Posted February 17th, 2013 at 11:27 am | Log in to reply. Posted February 10th, 2013 at 11:31 am | Log in to reply. Posted February 11th, 2013 at 12:19 pm | Log in to reply. Adding radish will make the broth more tasty. yum! Posted January 15th, 2013 at 7:38 pm | Log in to reply. I made this today and was so pleased with the taste! One of my favorite dishes is dubu chorim and this is a close sister recipe! I love all matter of things pickled, so this is a winner in my book! Thank you for sharing your recipe! We’ll eat it with some bulgogi and miso soup tonight for dinner over rice. Posted January 18th, 2013 at 6:25 am | Log in to reply. I’m very happy to hear that you like all matter of things pickled. The pickled sliced onion is so tasty, isn’t it? Posted January 7th, 2013 at 2:28 pm | Log in to reply. I made this last night. This is a very delicious recipe! I also used fresh shitake and think it turned out very good. The brine is so delicious, I don’t want to discard it! Posted January 15th, 2014 at 1:32 am | Log in to reply. Fresh shiitake mushrooms worked well? Awesome! Posted January 5th, 2013 at 9:29 am | Log in to reply. It’s been a long time since we last ‘talked’ but just so u know, i am still following yr blog closely and hv been making all yr awesome recipes repeatedly (that’s why there hasn’t been any new photos!). I made this tofu recipe just now and finished more than half of it (it was my lunch and dinner!) so I didn’t get any photos in the end. As always, yr recipes are SUPER YUMILICIOUS! So this tofu dish is no exception. I hv been making alot of walnuts wrapped in Korean dried persimmons and also the persimmon drink with cinnamon. These are my favourite for winter. Once again, tks so much for yr fantastic recipes. Wishing u a happy & healthy 2013. Posted January 8th, 2013 at 9:31 am | Log in to reply. Happy New Year to you and your family, Irene! You always love healthy and delicious food. Good luck with your Korean cooking! Posted December 30th, 2012 at 9:58 am | Log in to reply. It looks so delicious , going to try making this later , oh and i have the same glass dish !! LOL , iinstead of dried shiitake , does it matter if i use fresh shiitake ? Posted December 30th, 2012 at 4:05 pm | Log in to reply. I’ve made this just now using fresh shiitake , it was so good ! Loved it , a perfect side dish ..i could eat this everyday ! Posted December 31st, 2012 at 12:09 pm | Log in to reply. Olivia, yes, your tofu pickles look fantastic! Fresh shiitake mushrooms worked well? Thank you for letting me know about it. Posted December 30th, 2012 at 6:42 am | Log in to reply. I made it! Yesterday Dubujangajji was that best! Thank you Maangchi and Happy New Years! Posted January 8th, 2013 at 9:32 am | Log in to reply. Posted December 29th, 2012 at 6:16 am | Log in to reply. Dear Maangchi, I’m so upset! Yesterday I made your recipe for Dubujangaji, und I made it really good. I taste it and almost can’t stop to try. The Muschroom ware so good, soft like meat, and the onion really tasty, and all the ingredients have ad a very special taste to me. But, I want to keep my glass container in the refigerator and that broke up! The glass was overall! I cried really bad! It’s was hard for me to find tofu yesterday, and I made three time the way to search overall. I had misfortune yesterday, but today I’ll try another time and this time must goes all in the best way. Thank you for your wonderfull tasty recipe. Gamsahamnida! Posted January 8th, 2013 at 9:33 am | Log in to reply. “all the ingredients have ad a very special taste to me.” yes, I agree! I love the taste of pickled onion, too! Posted December 13th, 2012 at 6:20 am | Log in to reply. Hello I’m from Ukraine. Your site – what I was looking for 2-3 years. Thank you very much. I want to learn to cook Korean food, because the food in Korea is very tasty and healthy compared to the one I was used to. How much % of acid in vinegar? How many milliliters in a cup? Posted December 3rd, 2012 at 10:31 pm | Log in to reply. I’m very excited about this recipe. Do I have to discard the garlic cloves and the apple? Posted December 16th, 2012 at 1:37 pm | Log in to reply. You can store this dish safely in the fridge for up to 2 weeks. “Do I have to discard the garlic cloves and the apple?” I discard it but you can eat it if you want. Posted December 16th, 2012 at 10:50 pm | Log in to reply. I’ve made this recipe once and the entire batch only lasted a day. I will definitely double the recipe next time. Posted November 30th, 2012 at 8:40 pm | Log in to reply. Posted December 16th, 2012 at 1:39 pm | Log in to reply. Posted November 30th, 2012 at 8:03 pm | Log in to reply. Annyeong Maangchi, this dubujangajji is Daebak!!! Am gonna try it as soon as i can get my hands on some yummy tofu!!! Kumopsumnida! Let me know how yours turns out. Happy cooking! Posted December 16th, 2012 at 11:35 pm | Log in to reply. Guess what I sent you a picture of my dubujangajji and I love the taste of it and I will be sharing this with a fellow Hansik Lover! Posted November 30th, 2012 at 7:30 am | Log in to reply. That looks really delicious and so do you! Posted December 16th, 2012 at 1:38 pm | Log in to reply. Posted November 29th, 2012 at 4:30 pm | Log in to reply. Love your hair doo, and thankyou for the new tofu recipe, looks good, can’t wait to try it! Posted November 29th, 2012 at 6:29 pm | Log in to reply. Let me know how yours turns out! Happy cooking! Posted November 29th, 2012 at 3:07 pm | Log in to reply. Thank you Maangchi for share! Posted November 29th, 2012 at 6:28 pm | Log in to reply. This recipe was originally posted on November 29, 2012 at 1:34 pm by Maangchi. It was last updated on August 7, 2017. The video was watched 496,572 times on YouTube & has 5,614 likes!